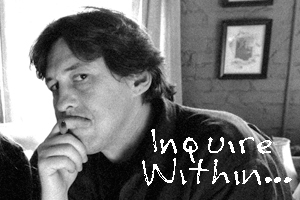 We present an archive of all Inquire Within… posts where Cameron answers your questions. We do not accept unsolicited submissions of any kind (story ideas, scripts, intern requests, actor resumes, etc). Contact information is provided solely for questions regarding Cameron and his films. Unsolicited submissions will not be read, viewed or returned. Thanks for your understanding. Please send in your questions for Cameron and maybe yours will be part of a future installment. Adam Labat: Are either of Nancy Wilson’s scores for Almost Famous and Vanilla Sky ever going to be available in their entirety like it is for Elizabethtown? I really dig those cues and would love it if they were available for public consumption. Cameron: We love getting this question. Nancy’s scores really complemented those movies, and the process of sculpting the cues was a joyful process. In the case of Vanilla Sky, thanks to Jeff Greenberg at The Village Recorder, Nancy was holed up for months turning out whole soundscapes… much ended up in the movie, and much did not. We have a busy release slate for this year but both of those film scores are never far from our minds and we hope to have them out very soon. In the meantime, you can listen to or download ”Cabin in the Air” from Almost Famous as a taste of things to come. (Doug Goodwin & John Myers): Given your musical background, In Jerry Maguire – was Jay Mohr’s character name Bob Sugar in any way a tribute to Bob Mould and his post Husker Du band Sugar? Cameron: It’s funny, I get asked about this quite a bit. Being a longtime collector of all things Husker Du and Sugar and Mould solo… there’s a part of me that wants to say, yes, it’s a tribute to Bob. But, there’s actually another story behind the name, with a different musical slant. I was in Dublin, Ireland, in July of ‘93, doing interviews with Pearl Jam for a Rolling Stone cover story timed to the release of Vs. The band was playing at Slane Castle, with Neil Young and Van Morrison, and most of the groups were staying at the Mercer Hotel. Most everybody ended up at a bar down the street named Lillie’s Bordello. One night Mike McCready and bunch of the PJ roadies had gathered there. The place was packed. The word was that the Rolling Stones were in town, and sure enough, the door swept open and in rolled guitarist Ronnie Wood with a small entourage. As we were leaving, we bumped into him. I had written about Woody for Rolling Stone too, and hadn’t seen him in a bit. The bar was loud, and Ron looked a little bit furtive as he yelled/talked over the music. ”I’m being followed!” he told us, looking both ways. ”There’s a guy who is stalking me, and he finds me wherever I go. I don’t trust him, and he seems nice, but he scares me.” At this point Woody leaned forward, eyes widening. ”He says his name is… Bob Sugar! Bob Sugar!! Can you believe it??? ?” He seemed very emphatic about telling us the name, and we weren’t sure why. Before long, Woody had disappeared into the night, but we couldn’t shake the image of a rattled Rolling Stone being followed by a strange man named Bob Sugar. All night and into the next day, we kept recounting the story, saying the name with horror. We couldn’t stop saying the name. And then something occurred to PJ roadie Jeff Ousley. “Wait a minute,” he said. ”He didn’t say Bob Sugar. He said, ‘BROWN SUGAR.’ We just heard him wrong.” We knew Jeff was right, between the noise and Woody’s accent… of course. He was being creepily stalked by a guy named Brown Sugar, after the song. But the name Bob Sugar just felt so much better and so much more fun to say. So we kept doing it. When it came time to name the characters for Jerry Maguire, Sugar was the first one on the page. The perfect name for a nemesis — it rolled off your tongue with ease. Jerry Maguire came next, named in part after my first editor at the San Diego Door, Bill Maguire. Originally Jerry’s wife-to-be was named Patty, but that never seemed right. Six months later, after a thousand near-misses, the final name arrived and stuck — Dorothy Boyd. But the one that arrived first…remains as fun to say as it was the first time we misheard it. Gotta give Ron Wood credit for it. That having been said, my next Bob will be dedicated to Mould. Cameron: Thanks for the question, Tony. The fact is that we’ve been hearing more and more about Vanilla Skylately. On our recent travels for We Bought A Zoo, there were a lot of questions about the movie, and a lot of passionate fans who wanted to discuss it. It’s fueled our desire here at Vinyl Films to start planning the Blu-ray, with a new commentary track, the original ending included, and a lot more Kurt Russell, Michael Shannon, and Tilda Swinton among other elements. I think ultimately it will come down to Paramount hearing from the fans, so feel free to write ‘em and tell ‘em you’re interested. It feels like the time has come back around for the movie, which was certainly polarizing in the day, coming as it did right after 9/11… but has now settled into its own psychedelic groove. Certainly would be a joy for all of us to dive back in and pull out some of the rarities that were such a big part of the early cuts of “V Sky.” Tech support!! Doug Shiloh (Rockford, IL): Two of your major films Vanilla Sky and Jerry Maguire (which are favorites of mine, by the way) delve into redemption for people who were in the kingdom of greatness, one way or another. How do the new documentaries further your look into this territory (Leon Russell’s return seems to be part of this). What is it about the theme that grabs you? Cameron: I think many of the great heroes in history, from Winston Churchill to Steve Jobs, were cast out of the kingdom of greatness. Their life-defining work sometimes happens upon their rugged return to power. That theme has always grabbed me. It’s very easy to throw in the towel, but sometimes a simple refusal to give up leads to a whole new life. This theme began for me with Brad Hamilton’s story in Fast Times at Ridgemont High. The fast food king was able to return with a simple twist of fate… the unexpected help of the person he least expected. Spicoli. When we first saw Fast Times on a big screen with a paying audience, it was that moment that caused people to applaud in the audience. I never forgot that. And it’s even a theme in Pearl Jam Twenty. When many of their contemporaries were giving up, and giving up on the band itself, they kept going… and found the passionate audience that keeps them alive today. Thanks for the question, Doug. Leah Greenwood (Raleigh, NC): The first time I saw it, in the theater while in college, I walked out and decided to change my major. Almost Famous (and therefore you) are single-handedly responsible for my renewed focus on writing/English/journalism. What movies changed you? Shaped you? Winds up in your DVD player every month? Cameron: Thanks Leah. I hope you stuck with it — journalism needs you. It’s still a living, growing and important field… whatever the format, print or blog or online. Nothing beats the importance of details, and the discipline that comes from checking facts. Sometimes in the immediacy of online blogging, details sadly go out the window. But truth always still reads like the truth, and if you’re in doubt, the NY Times or The New Yorkerand a number of other hallowed publications are still touchstones for the timeless kind of journalism that will always need a home. I was changed by a bunch of films and books. The works of journalists Seymour Hersh and Jonathan Alter are simply great, as are the absolutely gripping Robert Caro books on Lyndon Johnson. Most recently, Bob Dylan’s reinvention as an author and even a DJ (Bob Dylan’s Theme Time Radio Hour) are big in my house. Movie-wise,Carnal Knowledge is a timeless inspiration, along with the movies of Preston Sturges, and Wes Anderson, Jean Renoir especially Rules of the Game, Truffaut’s Day for Night, Stolen Kisses and of course, The 400 Blows. Spike Lee’s first three films are still amazing, Woody Allen’s Midnight in Paris is a reminder of a great writing and directing voice still in play… and Judd Apatow’s Knocked Up and 40 Year Old Virgin are aces for combining humor and wild surprise, and always a strong beating heart. And don’t forget Mr. Wilder and Mr. Ashby. The Uncool: Tell us about your writing habits. How often do you write? Cameron: I write every day. I listen to music every day. It’s kind of like keeping a creative radio-station tuned in. Life is always sending you a new playlist and I like to write down what’s coming in. The Uncool: Why did you decide to rework the location in We Bought A Zoo from England to Southern California? James Clark: Like your good-self, I am a huge Elton John fan and cannot wait to see your new documentary The Union. I’m so grateful to you for giving fans like myself an opportunity to see Elton (and Leon) doing ‘their thing’ in the studio. Why was “Mandalay Again” left off the main release? It’s such a beautiful song I actually think it’s one of Elton and Bernie’s best… ever! I’m assuming here that you were privy to the conversations that lead to it being left off the album and was hoping that you may be able to shed some light. I’d also love to hear your thoughts on the song. Cameron: Like all of us who worked on the film, we loved “Mandalay Again.” LOVED the song. It was a surprise to us when Elton John decided that it didn’t quite fit in the specific tone of The Union. I think his reason was that it was a little too much in the “classic” vein of Bernie and Elton’s later work, and maybe not necessarily representative of the Union sessions as a whole. Glad he decided to release it as part of the deluxe edition of the album. We also loved the demos for many of the “Union” songs, and use “Never Too Old” in demo form quite liberally in the finished film. Nice question. To paraphrase Steely Dan, only a true fan could ask that. Justin Noszek: Singles is my all time favorite movie. Will there ever be an extended version released? Failing that, what about a Blu-ray? It would be a perfect tie in to Pearl Jam Twenty? Cameron: I’m with you, Justin. Andy Fischer, who works with me running Vinyl Films, is digging into the vaults at Warner Brothers to see where the footage resides. We have all the concert footage – including KILLER stuff on Alice in Chains – but the outtake scenes themselves are waiting to be discovered. Some of Chris Cornell’s unreleased score will be in PJ20 – which is great because he’s a natural scoring artist and did GREAT stuff for the movie that was never used. Cameron: I dig it. I keep thinking I’ll run into Nathan Rabin and we’ll have a great conversation about it. Every MPDG he’s assigned to me has been based on a real woman, though, so they’re not really “cinematic creations” to me. Often that persona is a front, and every true man’s job is to dig beneath the surface and really come to know the woman he finds himself in love with. Still, the coinage is hilarious. I love it. The Uncool: What films were required viewing this time around for your cast and crew before you started filming We Bought a Zoo? Cameron: Local Hero and the Sigur Ros documentary Heima. Both had a warmth and a feeling of getting lost in another world, a place you might never want to leave. At this point, I’ve ordered so many copies of these two films, if Amazon had a button that just said — “AGAIN” — I would press it. The Uncool: How did We Bought A Zoo come to your attention?